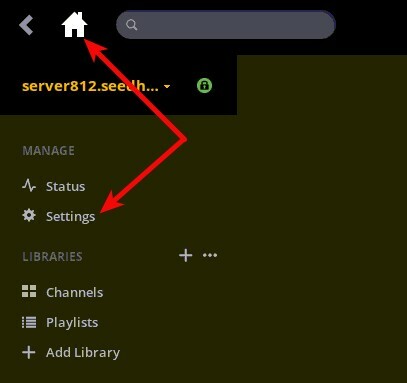 Plex is installed and running on all our dedicated seedboxes when a seedbox server is deployed. 2. When your plex interface loads, go to the „Settings” → „General” and fill in your plex account details. Firstly, you need to sign in to your plex account. If you don't have a plex account you need to create it. 1. Click on Remote Access. 2. Click on the "Show Advanced" button and advanced configuration will appear. 3. Tick on the Manually specify port. 4. Type port 32400 in a field. If everything is OK you will get info „Fully accessible outside your network”. If not please open a support ticket. 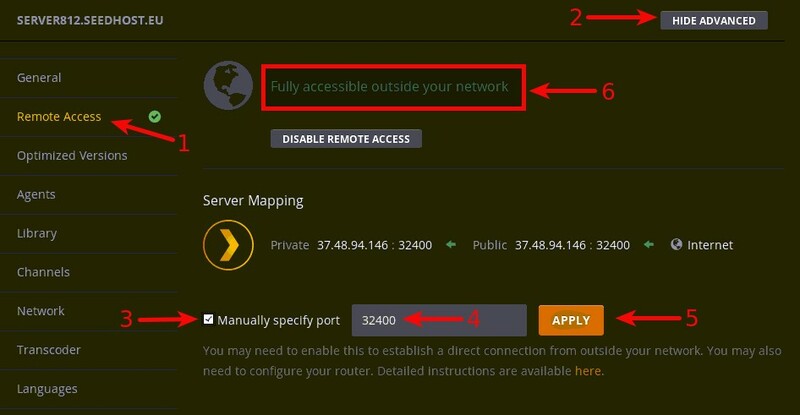 Now your plex is accessible outside the server network, you can access it with your web browser with the following URL http://server.seedhost.eu:32400/web (where server.seedhost.eu is your seedbox hostname) or with your plex account from any of your devices.